Gingivitis is the initial phase of the disease when the gums are affected superficially. Periodontitis is when the disease has progressed further and the deeper structures of the mouth and jaw are affected. If gingivitis is present, the gums will be reddened rather than the usual healthy pink colour. They will also tend to be more swollen in appearance. Inflamed gums also bleed, especially when tooth brushing or biting into something hard such as an apple. In severe cases of gingivitis, gums may bleed spontaneously. The major cause of gingivitis is dental plaque. Plaque is the accumulation of bacteria and saliva that collects on the tooth surfaces and other parts of the mouth. If the plaque is allowed to build-up around the necks of the teeth (where the teeth meet the gums), the gums become inflamed and gingivitis can occur. Some of the bacteria found in plaque are harmful and can cause gum disease. If dental plaque is left in contact with a tooth for a prolonged period it becomes hardened which is known as calculus/tartar. Tartar tends to attract further plaque which worsens the disease process. Prevent plaque and tartar formation by brushing thoroughly twice a day. Gingivitis can affect anyone at any age, although it is less common in younger children. Mild cases may go unnoticed for some time and there are often no symptoms during the early stages of the disease. However, if left untreated, gingivitis can progress to periodontitis, resulting in the destruction of the tooth attachment and the bone supporting the teeth. This ultimately leads to the affected tooth or teeth becoming loose. It is advisable to see a dentist or hygienist as soon as you suspect that gingivitis is present so that treatment can begin promptly to prevent the condition from worsening. The dentist or hygienist will carry out a thorough examination and will treat the condition. The first stage in managing the disease is to make sure that the teeth are brushed regularly and effectively, and taking care to ensure that the toothbrush is applied correctly to the tooth-gum margin at the neck of the tooth. First move the lower jaw until the teeth are in edge-to-edge contact and brush all the outside surfaces of the teeth and gums gently and thoroughly with a circular motion. Next, open the mouth and do the same to the inside surfaces of the top teeth and the surfaces of the lower teeth next to the tongue. Finally, brush all the biting surfaces and spit out the toothpaste (do not rinse). If effective brushing and inter-dental cleaning is carried out consistently for two weeks all the signs of gingivitis should fully stop. Sometimes specific anti-bacterial mouth-washes will be recommended to aid the cleaning process. The dentist or dental hygienist will also remove any tartar or calculus to enable you to clean properly. The process of removing these hard deposits is known as scaling and is usually carried out using hand instruments or with advanced ultrasonic technology. 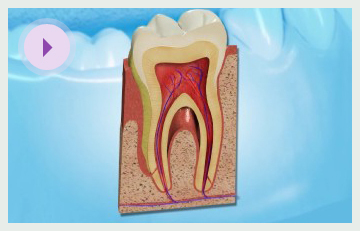 Periodontitis is the destruction of the tissues that hold the tooth in its socket. If left untreated it can result in the loss of teeth. Healthy gums are pale pink in appearance and firm. As previously stated periodontitis occurs once the signs of gingivitis (e.g. red/swollen gums, bleeding gums, bad breath etc.) have been established for a prolonged period of time. These symptoms left untreated can progress into periodontitis, resulting in the destruction of the tooth attachment and bone around the teeth. This causes the affected teeth to become loose and in some cases move. The depth of the space between the neck of the tooth (where the tooth meets the gum) and the gum indicates if there is a gum problem or not. These spaces are known as 'pockets'. These measurements taken by a dentist or hygienist show how severe any existing gum problem is. Healthy gums will smaller pocket depths (2-3mm), whereas teeth which have very deep pockets around them (5mm or more) will require deep cleaning. Periodontitis and gingivitis can affect anyone at any age. Gingivitis can usually be treated with improved oral hygiene. Periodontitis will often require intervention by a dentist or hygienist. Basic periodontal treatment involves cleaning out the deposits of plaque and hardened plaque (tartar) from above and below the gums. The treatment is usually done by using specific instruments to clean area which are difficult to brush, sometimes after making them numb with a local anaesthetic. In most cases the gum problems resolve after this type of treatment which is then accompanied by an effective oral hygiene routine at home. Gum problems are worsened by smoking and quitting smoking will help the treatment of gum disease enormously. Sometimes basic treatment is not successful at getting the gum disease under control. This is because the pockets in severe periodontitis are so deep that it is not possible to fully clean the roots without actually looking at them. The dentist may then suggest gum (periodontal) surgery. This treatment involves pushing the gums away from the teeth so that the roots can be visualised. It is only by doing this that the dentist can be certain that the roots are totally free of plaque. Surgery to replace the lost bone and soft tissues as well as clean the roots of the teeth. The dentist will usually refer such patients to a periodontist, who is a specialist in gum diseases and their treatment. Gum disease can have serious consequences. However if treated early it can often be arrested very effectively. If you have any concerns about gum disease please come and speak to us at Westdene about how we can help you.